These pages are copyrighted to Bunnycup Embroidery and may not be reproduced in whole or in part without the prior written consent of Bunnycup Embroidery. PHOTO TUTORIAL: What is Appliqué and how is it done? An appliqué design is basically where s design incorporates a section of fabric cut into a shape and secured to another fabric (your projects fabric) by blanket stitch or satin stitch. Digitizers automate the process in appliqué designs making the process of appliqué by machine embroidery simple and easy to do. Appliqué is fun to do, quick and produces wonderful results without lots of stitching. Also great for children's clothing where you do not want too many stitches against the child's skin. These instructions are designed for sewers who are new to machine embroidery appliqué and would like to see how it is done and how easy and fun it can be. The instructions go through the process of doing a simple machine embroidery appliqué design from Bunnycup Embroidery’s School is Cool embroidery design set. The principals apply to any appliqué embroidery designs. With Bunnycup Embroidery’s appliqué designs – in addition to these instructions, each design also includes a txt color chart which also has further instructions and the actual needle color changes. All of Bunnycup Embroidery’s appliqué designs are manually punched so that each step of the appliqué process is recognized as a distinct color change to ensure that your machine stops between each step. Some digitizers will put the steps of the appliqué process in the same color meaning that your machine will not automatically stop at each step. An example of a text color chart follows this tutorial. Properly stabilize and hoop your fabric. In this tutorial, the background fabric has been hooped with two pieces of medium stabilizer. Stitch out the placement line as document in the text color chart. 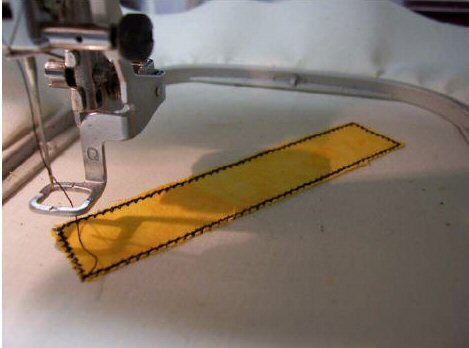 This stitches out a template which you will lay the appliqué fabric over. Cut out a piece of fabric that will over the placement line. 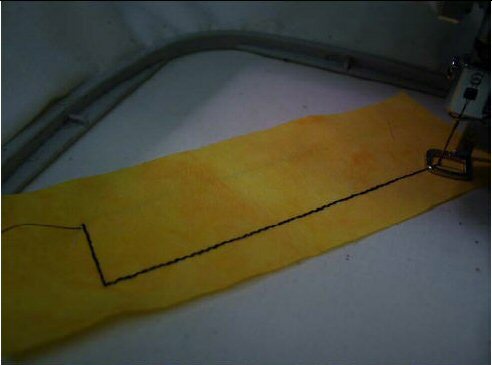 Place the fabric over the line you stitched. Some might like to spray the back of the appliqué fabric with spray on adhesive. Stitch the cutting line (as detailed in the text color charts). 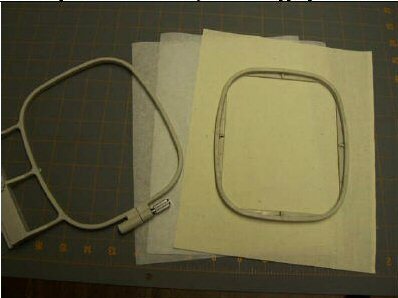 Carefully remove the hoop from the machine. DO NOT UNHOOP. 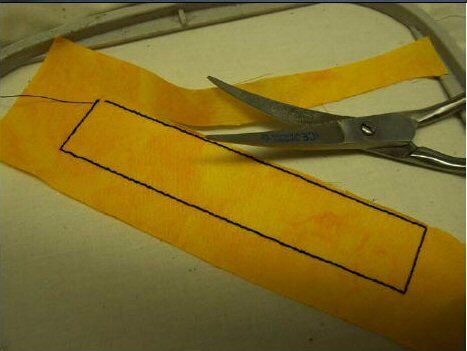 Using appliqué scissors (curved ones work very well), trim the appliqué fabric as close to the line as possible without cutting the stitching. Replace the hoop in the machine. 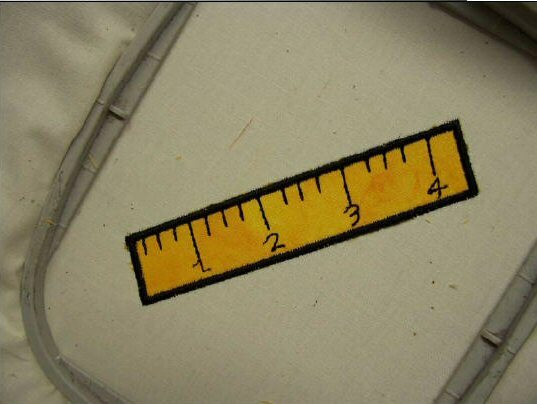 Proceed to the next step which will be either a tack down line or the appliqué satin stitch depending on the design. Refer to color chart for details of what step is next. A tack down line is sometimes used to further stabilize the material depending on the design. Stitch the final step, being the satin stitch outline, inch marks and numbers in this case. Viola, the cutest little ruler that ever graced a school. Appliqué designs typically come with a JPEG color chart and a text color chart. The JPEG color chart will show the digitized colors – but as each appliqué step is digitized in a different color to ensure your machine automatically stops at each appliqué step, you will also need to refer to the text color chart. The text color chart also includes some useful information as to the appliqué process. For this reason I have included an example of the text color chart for this particular design. You will see some colors that may be repeat colors, or many color changes in appliqué designs. It is important that you do not change the order to attempt to reduce the color changes. Many of the color changes are not actually color changes, rather are placement lines, cutting lines or tacking down lines. These are critical to the structure and success of your appliqué design. You will use the color of the appliqué stitch or a light plain color for placement, cutting or tack down lines rather than the color that shows up on your machine, software or that listed below. Where the needle below says placement line - these stitches will stitch out a template on your fabric to show you where to place your appliqué fabric (i.e. on top of your other fabric). Please the appliqué stitch color or a light color for these lines. After sewing out a placement line, place your appliqué fabric on top of your other fabric. It is suggested that you may use a light spray adhesive to attach the two fabrics together so that the appliqué fabric does not slip when the cutting line stitches out. 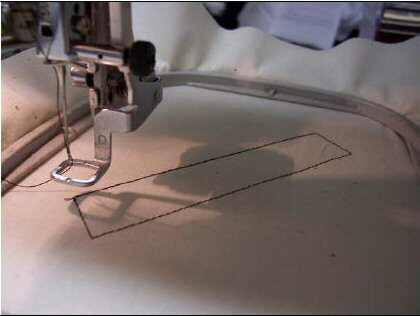 Where the needle below says cutting line, this is a line which you cut your appliqué fabric. It is recommended that you use a pair of nail scissors which will cut close to the cutting line. These can be purchased from embroidery shops or from pharmacies. Trim as close to the cutting line as you can without cutting the stitches. Where the needle below says tack down line, this will stitch out a set of stitches to further tack down your fabric. Where the needle below says appliqué stitch - this will stitch out the satin or blanket stitch forming the visible stitching of the appliqué. If there is no notation against the color below, the color noted should be used as it is an object (filled part or decoration lines) in the design. Please note that from time to time, an object color will show in between steps in the appliqué - this is necessary detail that will show on your appliqué fabric. My Outlines Are Off – Why and How Can I Improve Outline Performance? the fabric has not been adequately stabilized. If you are using a reputable and experienced digitizers design, the design in question will have been tested to ensure the outlines and components are properly in place and the underlying issue often is insufficient stabilization. I have included a section below as to some common stabilization techniques to help improve the performance of your stitch out. reduce your embroidery sewing speed to ensure precise placement of stitches. How do I properly stabilize my designs? Stabilization is tricky and complicated part of machine embroidery; however, it is also the underlying foundation of good embroidery. Without proper stabilization, designs may pucker or sag and outlines may be off, stitches may sink into the fabric or fabric might poke through the stitching. Stabilization is one specific areas that new comers to embroidery may not be knowledgeable and consequently is a common cause of heartache when stitching out designs. Many experienced embroiderers have developed their own technique as to proper stabilization, including adhering the underlying stabilizer with and adhesive spray and stitching a template around the hoop to attaché the stabilizer to the fabric prior to stitching out a design. Once learning what stabilization is recommended for your design and fabric, try some of these techniques to see if they help you in your stitch out performance. Typically used on cottons, canvas, satin and corduroy. Usually considered a light weight, soft stabilizer, though does come in may thicknesses. If using a large filled design (ie lots of stitching) it is recommended to use two layers of tear-away to improve stabilization. I personally use two layers most of the time. On completion of design slowly and firmly tear away fabric as opposed to pulling too quickly. Redwork and some appliqués should only require one layer of stabilizer. Typically used for knits, fleece, stretch denim, velvet, toweling, corduroy. Consider a medium weight stabilizer. If using a larger filled design, it might be necessary to use two layers of cutaway. Need to cut away excess stabilizer upon completion of stitching. A paper based stabilizer which has a waxlike film that you iron onto the back of the fabric. Can be used in combination with a layer of tear-away if you require further stabilization. Excess can be torn away or peeled off upon completion of stitching. Try to avoid iron-ons with too much glue which will gunk up a needle and cause stitching problems. Can be used on top of or underneath fabrics. Great to use on top of toweling to ensure fabric nap does not poke through embroidery designs. Good for intricate designs where it is impractical to tear away or cut away a stabilizer. Excess washes away in water. Stick on one side (and covered by protective sheeting). Typically used where fabric can not be hooped including quilts, shirt collars, cuffs, socks. Place stabilizer in hoop with sticky side up and place fabric on top of hoop/hooped stabilizer. Removed with the application of heat. Use only on fabrics that will not burn. Not a true stabilizer and can be used with tear-away. Attaches fabrics and can be used on back of stabilizers. How is it best to hoop fabric? The basic recommendation that I have here is to ensure the fabric is firm in the hoop – but not pulled excessively tightly or too loose as this again can effect the performance of your design. What format does my home embroidery machine use? The following table list design formats and the corresponding machine brand.